Get Your Finger Out of That! 30. Chicago White Sox: 2005 World Champions. - Let's just get this out of the way. I love that I have a shirt with this "slogan" on it. 29. Authentic Left Coast Punk – Because I am so punk, I love my MxPx shirt. 27. Jesus: Cooler Than Nature – All hail the genius of Randomshirts.com. 25. ‘I Want my Rib Back’ –Adam – I laughed aloud when I saw this one. 24. Anchorage Fire Dept. – Who else has one of these? Alaskan fire fighters. And me. I got it in Alaska because a guy in our work group was a fireman. Sweet. 23. The Decepticon Symbol – Not a slogan, no. But a picture of evil says a thousand and one words. 22. Fetchez la Vache – My Spamalot shirt with flipping cows. 21. Calvinism: This Shirt Chose Me. Arminianism: I Chose This Shirt. –My boss has this shirt. It’s smart funny! 20. See Your History Die – I wasn’t really in love with my Staple shirt when I bought it. I just wanted a Staple shirt. But this slogan has really come to mean a lot to me. 19. Too Close for Missiles. I’m Switching to Guns. – I couldn’t pull off this muscle shirt (because my muscles are too big), but it makes me giggle. 18. Jesus is my Muffin man. Do You Know the Muffin Man? – This was the first winner of our magazine’s T-Shirt Slogan Contest. 17. I Am a Whosoever! –John 3:16- This was last year’s T-Shirt Slogan Winner. I thought it was so clever. 16. Push Button. Get Bacon. 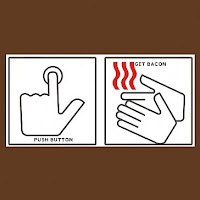 -I will never wash my hands again…without thinking of bacon. 15. Robot Reading Coloring Book –I love the online description, "If you ever wondered what a robot going through a Relient K coloring book looks like, well, this is it." 14. Predator- This was a gift from a high school friend because I watched the movie almost weekly. 13. I Do All My Own Stunts - A gift from Marc to celebrate my style of sports play--that I have no style but just dive around and "do my own stunts." 12. I Wish I Didn’t Do all My Own Stunts - hahaha. 10. Don’t Hate the Player, Hate the Game - Funny for me to wear because of how "playa" I am. 9. "Have You Ever Heard of Five Iron Frenzy?" "Yeah, They Owe Me a Dollar." 8. Hip Hop Tour 1984 - A cool retro shirt I found at marshall's for $8! It makes the Top 10 for the line, "Where the Hip-Hop Don’t Stop Till the Breaka—Breaka Dawn." 7. Fact: Clowns Eat People - This shirt gets lots of reaction. Mainly because it is indeed a fact. They do. Actually, this shirt generates conversation because so many people just want to tell me about how scared they are of clowns. 6. Fact: Ninjas Hate Pirates - I love this shirt, but honestly if forced to pick sides, I am going Pirates. Yah, they might lose but they have sing-a-longs. Do ninjas? 5. Meat is Neat! - The perfect storm of a shirt. I love meat. I like to use the word "Neat" a lot. And, it is educational! Want to know your cuts of beef, just look at my torso! And that, my friends, is also a nice cut of beef. 4. Have a Whale of a D ay! - This is the second greatest T-shirt my sister has given me. It's just very Todd. And what's great is that it's like a puzzle. I love watching people trying to figure it out. 3. I Am Very Excited to Be Here - This shirt is meant to be a sarcastic comment. But with me, it is true. All the time. Wherever I am, you can bet I am exicted about it. I am like a puppy. 2. I Am Incredible! - Tru dat. 1. Mayor of Awesomeville - My favorite shirt. And it's original. Which is fitting because Awesomeville can only have one mayor. What an entertaining way of fishing for brithday presents! You know you may get duplicates now. NOW-- please don't turn off the annon posting feature again. I sure hope your subjects never become dissatisfied with your leadership and end up moving to the new world and starting New Awesomeville. That just becomes too long of a t-shirt slogan. I am not fishing for gifts at all. Sorry it seemed that way. I own almost all those shirts. And to Anonymous: I only turned on the anon posting feature because it messes with all comment posting when it's off. But I prefer to have all posters registered. I like to know who says what. So please register. Take credit for your comments. FYI: I may often delete any anon comments. HEY this is Lil' Sis, but I couldn't figure out how to put my name on it without being anonymous.. anyhoo! I like that posting esp since I made top 5 twice ;) and guess what it's almost your birthday which means you get to shake presents!!! WOOT WOOT! !